I once made the observation that sunsets tended to be like Wagner, and sunrise like Debussy, the former spectacularly colourful and dramatic while the latter tends to be more subtle. Not this morning though, wow! 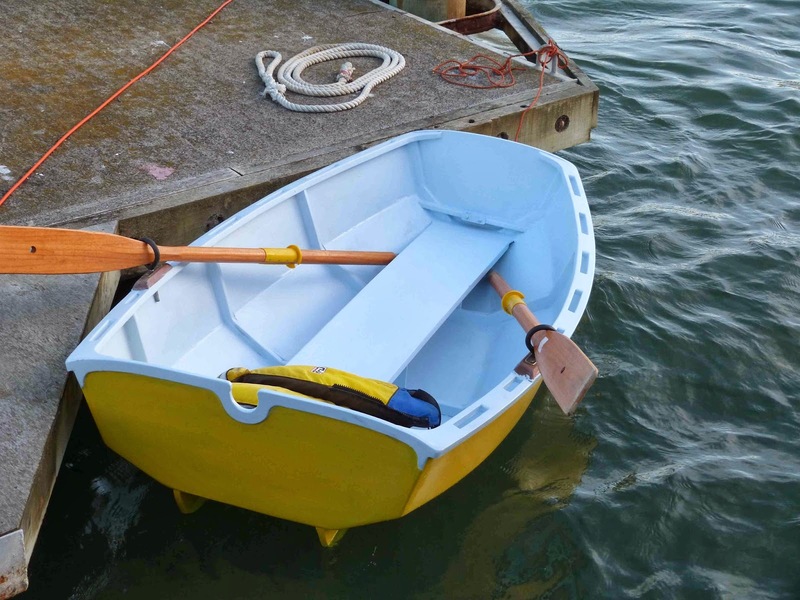 Its 0645h, I’m sitting here in bed hammering away at the keyboard writing a building manual for the little Scraps boat plans, putting photos in and captioning them while trying to keep the text informative without being pedantic and over long. I woke at 0330h, the cup of tea I drank at bedtime making its presence felt and while up found that it was raining so drove the truck up to the top of the track that runs down through the bush to my little haven here. When wet that steep, sheltered bare dirt track can get too slippery to get back out and rather than be trapped here until it dries, I shifted the vehicle up to the flat grassy paddock at the top. I do hope I did not wake my neighbours with the noise of the rattly little diesel. The “other” neighbours horrid dog did not wake though which is a blessing, his bark sets off all the other dogs in the neighbourhood. Back to the sunrise though, there is about 30% cloud cover, all streaky and a mix of high and low, the sun is coming up under them and the colour and effects are stunning. It started with pale green, went through darker green and blue with streaks of rose then bright brick red and is now almost the whole palette including purple and patches of black under the heavier of the clouds. Wow! Normally I’m one of those people for whom this time of the morning is a figment of other peoples imagination but I’m glad to be awake to watch this one. In the water at last! Its only been a little while really, while I’ve not been able to work on her full time its not been long since I drew those lines out on hardboard and started chopping up refugees from the pile of leftovers in the corner of the shed. She took about 17 man hours to build, including a fairly rough paint job. Not bad, yacht tenders get a hard life and any cruiser will need to build one every couple of years. They get rolled in surf, crushed between the wharf and the mothership, dropped, overloaded, stolen and generally abused so a quick build is often needed to replace the modest but very necessary little craft. I put “Scraps” in the water an hour or so ago, just slid her off the dock and climbed in. “Offcuts” was close to 300mm (a foot) shorter and a bit narrower, not as deep in the hull either, and the difference is very noticeable. Scraps is much more stable, I can stand up in her if I’m careful and she feels good when climbing in and out. 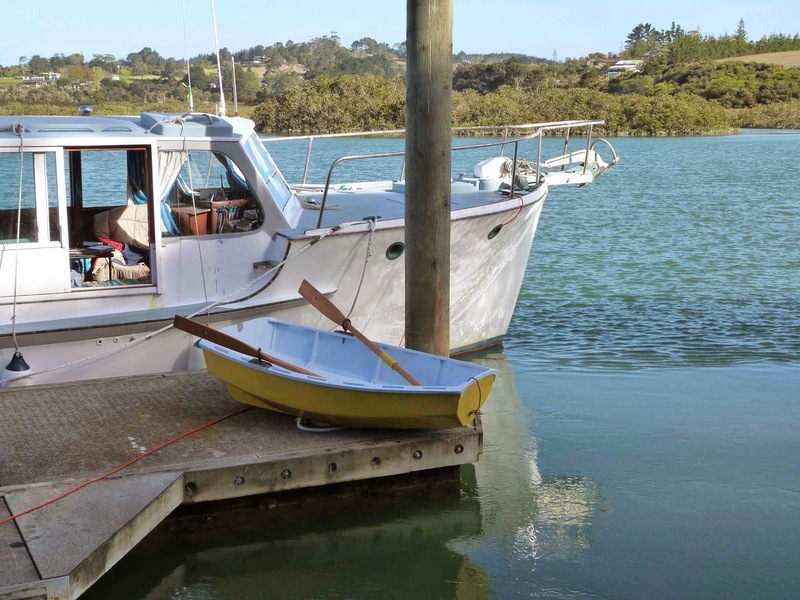 I think I could carry a decent sized anchor and chain out in a bit of a chop if needed, she rows straight, turns well, is about neutral in a crosswind and handled the wind against tide chop here in the estuary very nicely. I’m here on my own today so until wife Denny comes to visit in a couple of days I don’t have any pics of me rowing the new boat around, but here are a few pics of her at launching time today.
" Hi Mum, dont I look cute. Look, I've got oars and everything!" "Careful sweetie, its wet in there." "Its ok Mum, I can swim"
"But I think I'd better take John with me if I'm going far!" My website URL was registered with a company that does that sort of thing, costs a few bucks a year for same. But over the years communications with that company have been erratic to say the least and on one occasion a while back they cut us off without notice for non payment, no invoice, no notice, not a word. Just "Chop" and no website. With that in mind and knowing that the time for payment of the annual extortion was close I tried my darnedest to contact them last December. I emailed, several times. I phoned, just got a whistle from their fax. Sent a couple of faxes, all of my missives asking them to please send an invoice and I'd see that it got paid post haste. Nothing. Not a whisper, and guess what! Last week, "Chop"! Guess what else? I've changed companies, with their help we'll be back up again in a couple of days at the same internet address. The new outfit got an invoice to me in 4 hours, I am now registered through them, am on their customer list, have passworded access to their help desk which is a 24/7 operation, and its way cheaper. All done between 2 pm and dinnertime, over the phone at that! The new company? Interspeed.co.nz . Should have done it ages ago! The errant outfit? The one with one less customer? PrimeHost . Be warned. Its a perfect night on the river. The full tide will be about 10pm, its dead flat calm and there will be a big moon that will I think rise about the time when the water is highest. At full tide we get slack water for about 40 minutes, the current at other times can be quite fast and I dont feel like paddling against it so tend to go up with the last of the incoming and back with the very beginning of the ebb. 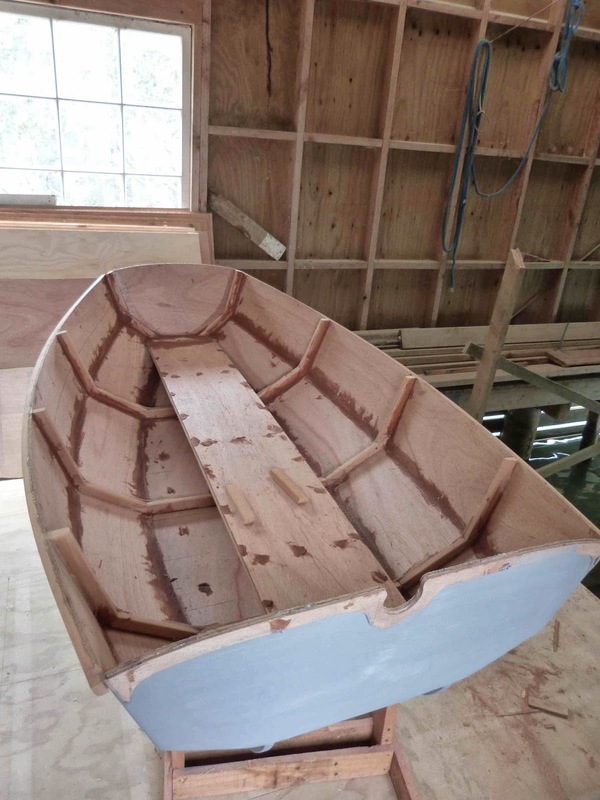 I'll be putting the little plywood kayak in the water in about an hour, by then I'll have had enough of wrestling with the publisher software that I'm using to put together a building guide for Scraps so will be very pleased to be off up the river in the moonlight. Scraps is almost done, some tidying up to be done, angle grinder with a sanding disc and the big Festool random orbital will do it, and then paint the interior. Its only a tiny thing and I feel as though I could pour a big can of paint into her, pick her up and swill it around then pour the excess out. Nice thought, but it will be a paintbrush as usual. 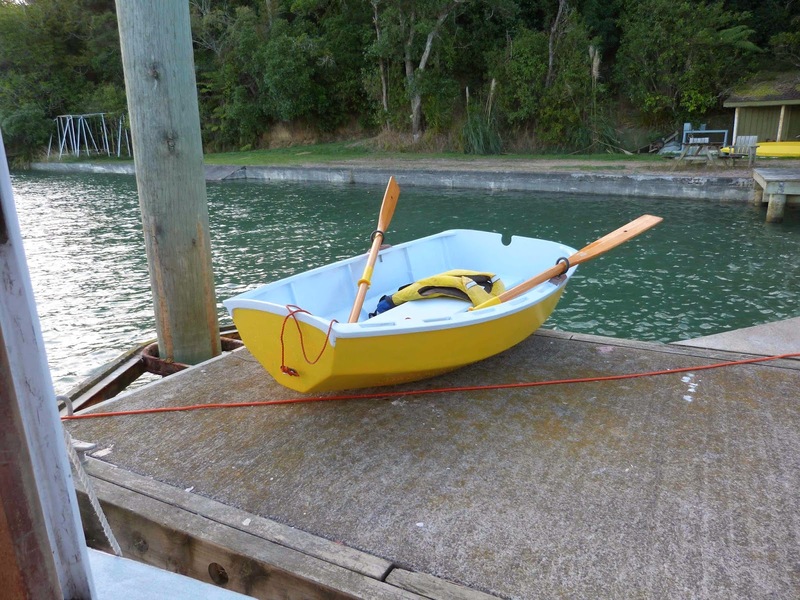 Then its fittings on, and I"ll be bringing a set of oarlocks, oarlock sockets and oars up from the Hamilton workshop and expect to be having a launching next week. Sat 22nd and Sun 23rd March. Its on, we're expecting about a dozen boats so far but there is space for at least twice that. Is a social event, no real structure or competition, although we've some vouchers from our sponsor Burnsco in Mt Maunganui. There will be a launching of a new boat, I'll be there to talk and help, a bunch of people of like minds will be there to chat to and share experiences with. Heres a chance to enjoy the company of people with similar obsessions to us! If you are staying overnight, book with the motor camp . If not there is a small fee for parking and the use of the ramp and docks, its a very nice place and well set up for this kind of event. Everyone welcome, boat or not. JW boat or not, See you there. Adding to the tool collection. We're having weather forecast that sounds really serious, Tropical Cyclone Lusi is heading our way after battering Vanuatu, it brings sustained hurricane force winds plus extremely heavy rain. Its been a dry summer here in New Zealand and we could do with some rain in these northern parts but not the torrential downpours that characterise these big tropical storms. Tomorrow I'll be spending some time making sure that I am all organised for the storm, the new docklines will be doubled up, the tools and machinery raised up off the floor, the windows and doors all protected and the hatches battened down. So heres tomorrows blog posting. This was the second time I’d been in contact with heavy woodworking machinery, the first being at Philip Langs boatbuilding shed where my Grandad did the book keeping while I, at about 10 or 12 ran around being the gopher and tailing out machinery. That shed by the way is still there, just up the road from where my ship and boatshed is. Its an auto panel shop now which is a sad comedown for a place where dreams were once made real. Back at the joinery factory it was not long before they picked up that unlike the others I liked machinery and within a reasonably short time my duties included tooling changes and setups, maintenance and adjustment of the various machines in the shop. Life went on, I moved on, spent a while driving a shovel and a bulldozer, a while in the army, and so on. But the love of the heavy woodworking machinery stayed with me, and years later I became a sales engineer selling, installing, commissioning and trouble shooting really big sawmill machinery, mostly planermills and the likes of band resaws, fingerjointers, laminating presses and so on. I still work on woodworking machinery, am a maintenance contractor part time to a Saw Filing and machinery shop. It helps pay the bills. I digress, I am a bit of a collector of hand woodworking tools, last count when I looked, between hand planes, spokeshaves, drawknives, etc I had 44 items. I added two more yesterday, both uncommon if not really rare. The uncle with whom I worked way back then lives with my widowed mother, he’s 83 now and slowing down a lot. 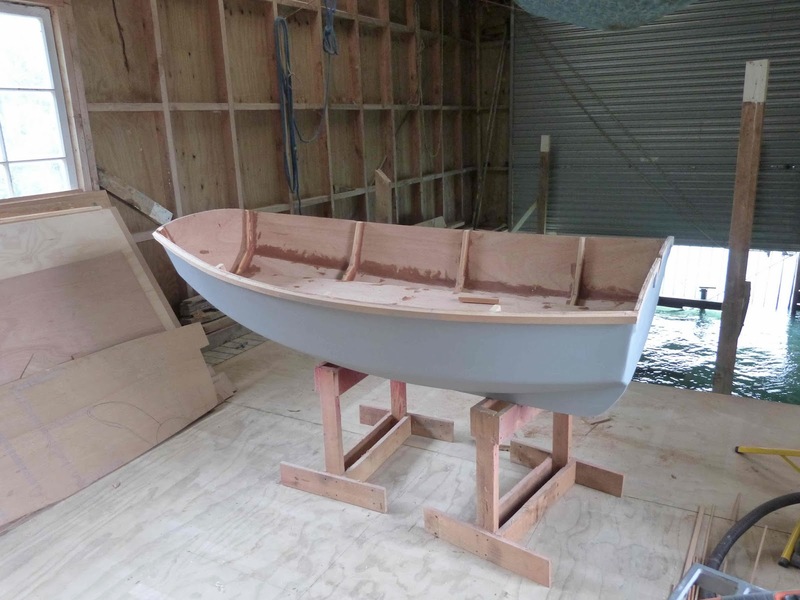 When setting up the boatshed as a second workshop I’d bought from him (for “beer money”) a nice little bandsaw, a small jointer and a table saw. They are doing sterling service now, you’ll see them in the background in the pics of what I’m doing in there, and I’m glad of them as there is no way I could spring to buying new or even second hand at the moment. But the old gentleman has picked up that I have an interest in tools so when I was there yesterday he took me out into his shop and mumbled around hunting in drawers and cupboards for a while, pulled out two very original boxes and presented me with a Record compass plane and a Stanley router, both probably bought new in the late 50s or early 60s. 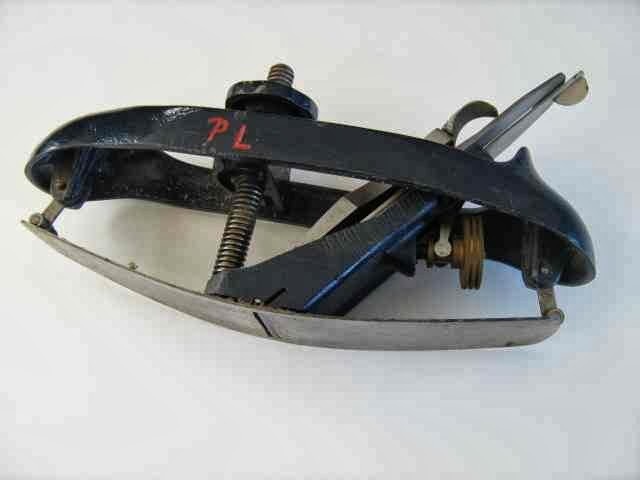 The plane, for those who are unfamiliar with them, has a flexible sole and a mechanism for forcing it into a curve so it will plane around the arc of a circle, both inside and outside. Its useful if for example you are making the top sections of a gothic arched church window, or a large circular section such as a wagon wheel. Today you’d use a power router and a template or a spindle moulder (shaper). Old Pete did a number of church windows, for the last few years before he retired in his mid 70s he had his own little workspace in a separate building out the back of the factory and built the likes of a wooden spiral staircase with no center pole, a large wooden rose window for a Cathedral and an extraordinary lecturn, all swooping curves and rounds, for a university lecture theatre. On that staircase, it’s a pretty amazing piece of work and the church now tells a story about how a man walked into the church and offered to build it, that he was divinely inspired, and that no one to this day knows where he came from or how it was built. They claim it as a minor miracle if you like, but the truth is that the Pastor in charge had asked Petes boss if it were possible to put a staircase in the space. Pete and old Sam the boss had gone and had a look, and Pete had built it. Normal commercial work for money, the result was pretty special but no miracle, just a skilled worker with the time and experience to do the job. But by the look of it neither the compass plane nor the hand router were ever used. The plane still has its shipping grease on and neither have ever been sharpened. In both cases the soles still have the original machining marks on them. Oh yes! 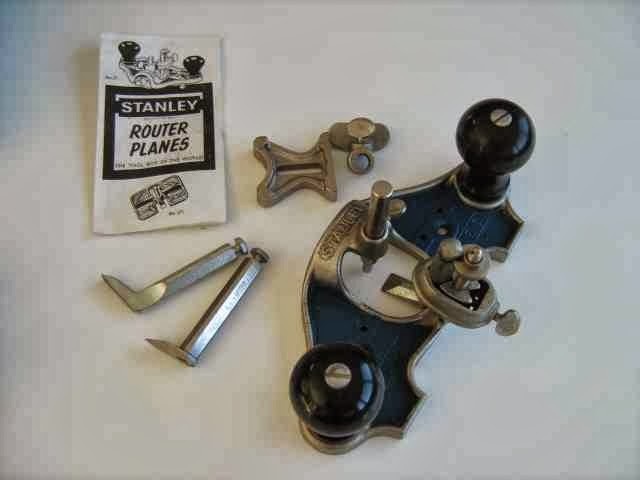 For most readers the word “router” in terms of a woodworking tool will mean those electric things that make loud screaming noises and cut more wood away than you planned! 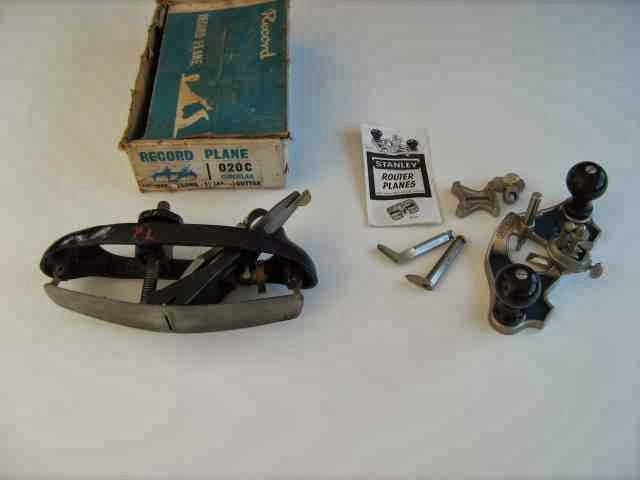 But had you thought of what its predecessor was, the one that did not have to be plugged in (the true cordless machine, powered by elbow grease)? This, in the photo is a router, sometimes referred to as a “Grannies tooth”. Its for cutting away material below the surface of the wood, great for rebates but today I use mine when doing high relief woodcarving where material has to be removed to produce a raised area to be carved into whatever that stands clear of the background. It’s a nice, peaceful tool to use. I had three, various sizes, now have four including a really nice new one so can retire the sad old mid sized one that I’d picked up in a junkshop. Thanks Pete, they’re in good hands. So what does a guy who lives on board a boat do when its bucketing down with rain? Well, read, write, cook, do the tax accounts (arrrgh!) or, he can make new dock lines. I’ve five on this boat. Bow, forward brace, forward spring, aft spring and aft brace. The old ones were not in bad shape but were all refugees from other docks or boats, had to have knots that in them and tying knots in 3/4in terylene three strand laid rope that is all full of salt and sun damage is not that easy, so its new docklines. 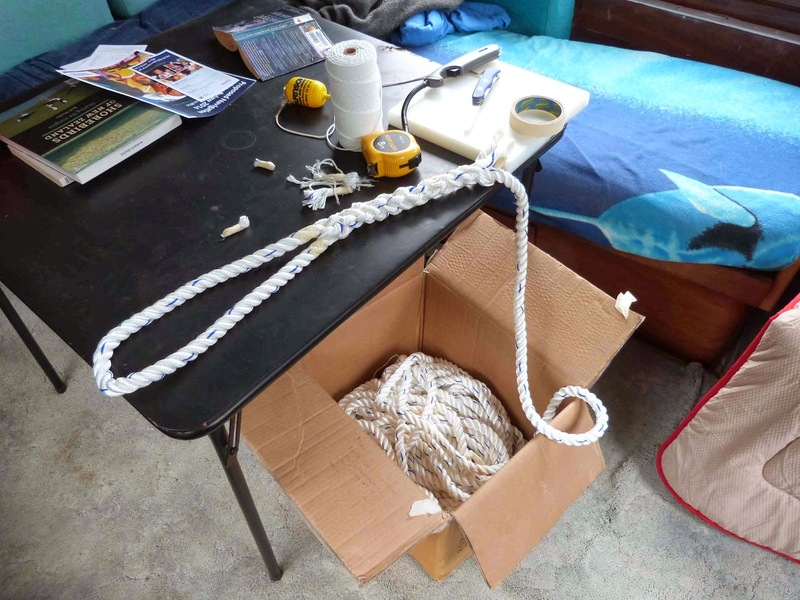 I bought a half roll of 15mm Polyester three strand laid rope, that’s about 150 ft of it, I only need about 1/3 of that but it was cheaper if I bought the lot and who knows, I might have to make a hangmans rope sometime. Each dock line has a 10 tuck eye splice in each end, each splice with a whipping on each end, each whipping tarred with Stockholm tar. About 25 minutes for each end of the line to make the splice, the whippings and the tarring. Five lines, ten splices, 20 whippings and a whole lot of tar. Just a bit over 4 hours for the lot. 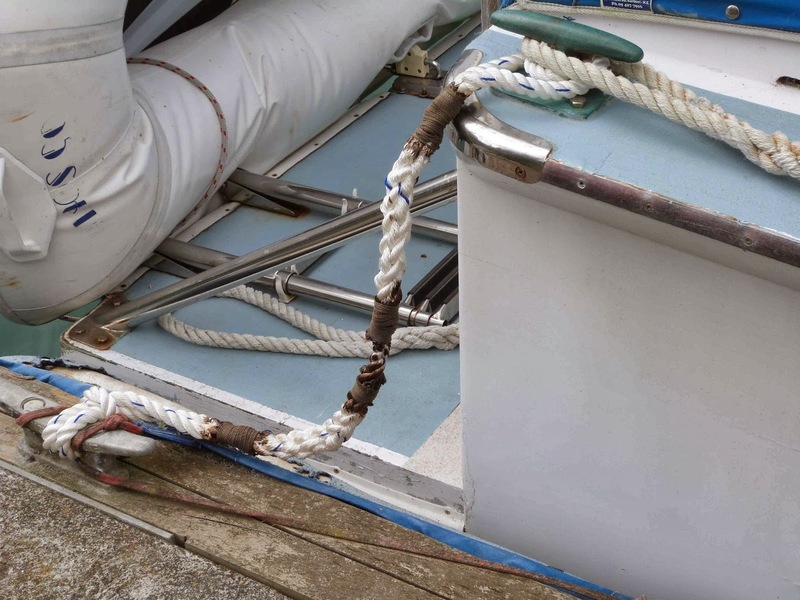 I’ll make up a safety line for bow and stern as well, that comes from the outside of the boat away from the dock across to the dock, that’s for when the boat is going to be left for a while, insurance if you like. I also need a line that is left permanently on the foredeck, it has enough length to come back just past the helm door in the main cabin and has a big loop so it can be dropped over a dock cleat when coming alongside, the helm then being put over while the engine is slow ahead which holds the boat alongside until the permanent docklines are dropped over the bollards and cleats. If they are all the right length with the right sized loops, it makes life a great deal easier, especially when handling the ship on your own. So that’s what a man does on a rainy day. Rainy day, but no blues apart from on the radio. Another quick report on progress out in the workshop. It’s a lousy day today, blowing hard and raining with it. We need it though, its been a very dry summer and this will kick off the grass and crop growth for the farmers and our vegetable gardens. While it’s nasty weather its not cold, about 24 deg c today and the forecast for tomorrow is good. One thing about New Zealand weather, if you don’t like it just wait for a few hours and it will be completely different. So, rather than being out in the Kayak or whatever, I have been puttering around doing the minor woodwork on “ Scraps”. I’ve made up the oarlock blocks, epoxy coated the undersides of the skegs, painted the outside of the hull with primer, and filled a lot of the screw holes inside. so there is a little more woodwork to do than will be shown in the plans. So for those who are interested, here are a couple of shots of “Scraps”. 6ft 3in long, about “that” wide and weighing about as much as I can lift easily in one hand. Yeh! I’ll have more accurate statistics later on. In the meantime I’m looking forward to trying her out in a few days time. Nice case, plenty of room in it without being cumbersome. Lots of space for tools, blades and various sandpapers etc. Secure clasps, good sized handles and a space for the service manual and parts list, just what you'd expect from a good quality manufacturer but so seldom actually get. Very occasionally there comes a tool that has the potential to change the way you work, and think about the work. I do a lot of close in detail work in my boatbuilding, and have for years wanted to treat myself to a really good multitool, one of those things that are descended from the saws that cut plaster casts from healed up broken limbs. 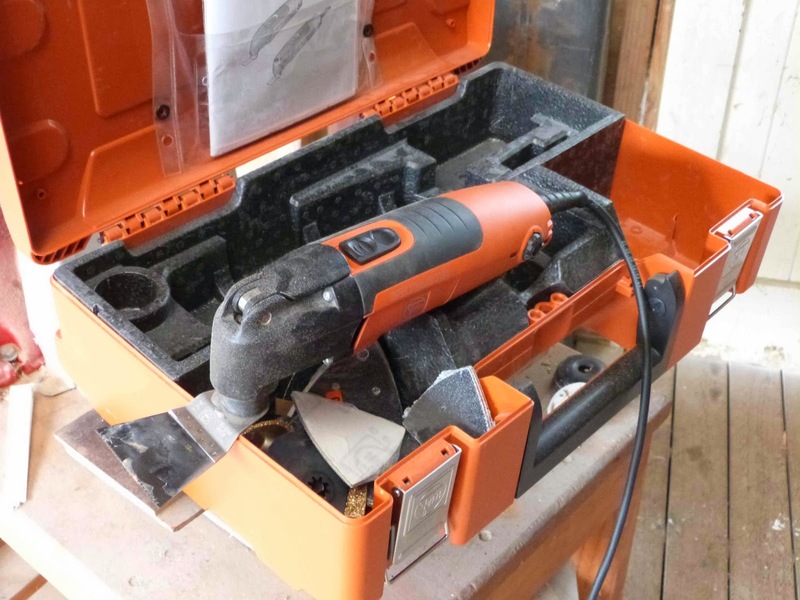 Fein were the first on the market with them, and since then there have been a number of similar machines from power tool companies. A while back I bought an Ozito brand cordless one, mainly because I want to do a lot of detail sanding work on the outside of the ship prior to a repaint around the cabin windows and side doors, and do NOT want to be trailing an electric cord behind me with the boat afloat at its dock. That could be a shocking mistake! The little Ozito, cheap as it was to buy, has its limitations when it comes to anything other than light sanding. It does a fair job on that but has not the power to do much else, sawing and grinding, cutting tiles, plunge cutting with the narrow blade and so on are not really its forte. But I have to say that its surprisingly good at sanding. Ozito is the cheap “house” brand for Bunnings hardware which is one of Australia and New Zealands “Big Box Hardware” companies, and I have to admit that for very cheap tools they are not bad. Do be aware that spares may take longer than you would like to get. But the fact that the Ozito one performed pretty well as a sander working on small areas but not so well on the other functions really did point out to me that a good multitool would be a very useful addition to my tool kit. So I went shopping, I’d a tiny bit of budget left for the workshop, and I figured that I might just about be able to scratch up enough to buy a midrange machine. 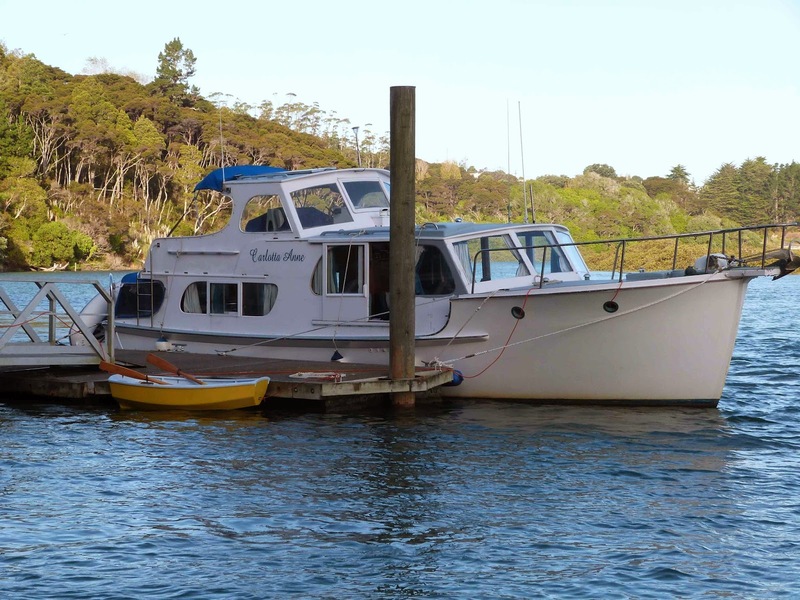 One of the things that I do to finance my boating habit is repair woodworking machinery, power tools among them which gives me a pretty good idea as to which are well designed and made and which are not. You’d be surprised at some of the things I find! I know I am! So, with a limited number of brands to choose from I went out to try some of them. I wont go into what I found among some very prominent brands, I might find an unwelcome legal letter in my mailbox so had best not say too much about the ones I did not choose. 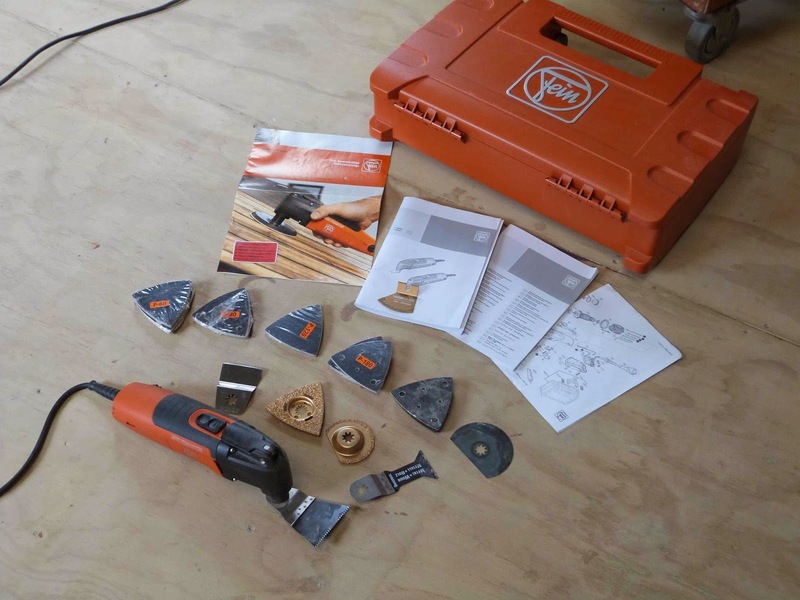 I will say though that a lot of the power tools you’ll find on display in most places are not suitable for continuous use such as a big job in a boat built or refurbishment. They are many of them DIY weight and if you are pushing them you’ll cook them or wear them out very quickly. So I bought a Fein Multimaster FM250Q. A serious professional grade tool. There are cheaper choices, but this is the top of the range, superb to use, powerful, easy to change tools and it came not only with a heap of different tools including ceramic cutting blades ( yes I have a job coming up for those), sanding, sawing in several varieties, plunge cutting, and grinding. The toolchanger is great, a lever on top, a very positive multi position locking mechanism and its very quick to use. Its changed the machine from one that is principally a single use unit that with some messing about you can fit another tool to one where swapping from one tool to another is about a 30 second task which requires no spanners or keys to facilitate. This system does not seem to have the issues with tool security that the earlier models did. Don’t likes? It’s a little heavy, but the way it fits my hand makes that bearable plus I think that the weight damps the relatively slight vibration. Some sanders leave the operators hands tingling for a while after extended use but this is not one of them. It’s a noisy darn thing, earmuffs! I find that the on off switch is not that easy to use but then on the other hand its not going to be accidentally triggered when moving the hand to hold the machine at a different angle. How good is it in use? A multitool is not the tool for heavy use, it’s for fine detail and the areas into which you cant get your random orbital, your circular saw or your angle grinder. Its for the most part a finishing tool, and for that the Fein Multimaster performs way beyond expectations. I’ve used it for tasks that I am sure its makers would raise their eyebrows at, one was to grind hardened excess epoxy glue from overfilled seams and it did not flinch even when I had both hands leaning on it, I’ve cut plastic pipe, steel pipe, wallboard, fiberglass, solid and plywood, cleaned out glue, sanded inside tight curves and lifted ceramic tiles. The tile cutting will come up soon and I am sure that it will perform there just as well as it has every other task I’ve thrown it at. The variable speed is easy to dial up or down, and that makes quite a difference on some tasks. Its changing the way I do things, I can cut where I could not, power sand where I had to do it by hand, chop off screws where I had to chisel them out (when the heads have stripped or twisted off) and I’m using it more and more. Supplier, Roberson and Sinclair Ltd, Hamilton branch. They’ll organise one over the phone and send it out to pretty much anywhere in NZ . Talk to Andrew and tell him I said he’d do you a deal. http://www.rands.co.nz Click on the “Hamilton Branch” link. It came in a really nice carry case with parts book, manual and user guide which was a bonus.